Karrie is the only one of her kind, a humanoid race called Yasson. As a child, she had great skills and knowledge and trained very hard to become the best Yasson. With Karrie’s special skills and items, she can the most powerful Yasson ever known. 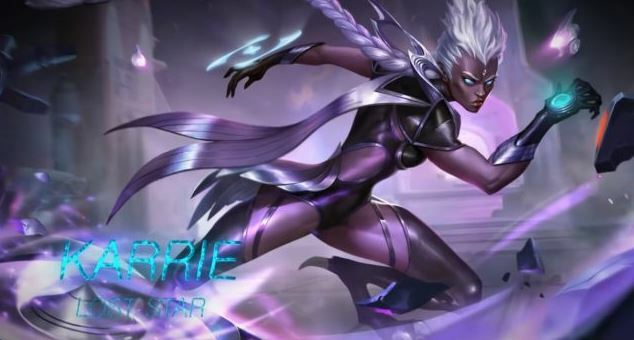 Karrie is with high offense and difficulty rate in MLBB, which makes her a great Marksman. Her specialty is to Reap/Burst damage, and trust me, Karrie can be a pain for some. However, if you don’t have the perfect build guide, then she can’t do much. I’ve tried different items, attack items, defense, magic, but I’ve found the best build for Karrie. Haas’s Claws – Adds 75 physical attack and 25% lifesteal. A great starter item that can speed up the process of making in-game cash and get the next items. Swift Boots – The boots will grant Karrie additional attack speed and movement speed. A smart choice is to get them right after the first item. Windtalker – Increases her attack speed, movement speed and critical strike chance. It goes great with her passive skill, because on the 5th attack, Karrie’s next basic attack will deal extra magic damage. Scarlet Phantom – Now we are talking! You now have +20% critical chance. Getting this item will add an extra 10% to the critical chance and extra 35% attack speed. Critical strike and attack speed are the killer in Mobile Game. Berserker’s Fury – This item increases Karrie’s physical attack for +65. Also, it increases her critical strike chance. Only these two items are enough for Karrie, trust me. Blade of Despair – Getting this item will increase one physical attack, attack speed and critical strike chance. Also, Karrie will deal extra 10% dmg if the target is in an abnormal state. You now have the perfect killer build guide for Karrie. If you have any other suggestions, please let me know in the comments section below. 0 Response to "Karrie Best Build Mobile Legends"